I can't believe its been more than a month since I last posted. I have been pretty busy with life things outside of the sewing machine. April is our month of birthdays and May is full of graduations. Needless to say I have been gifty sewing lately. Photos below are from Instragram. This is an iPad case I made for my mom for her birthday. I included a pocket on the back for cables and stylus pens. I also tried out my first 3D sewing in the form of purses. This first purse I made came out too tiny but it definitely got my feet wet to this type of sewing. My next purse came out much better and I think I have a couple more to sew for others. And finally I need your help on something. I made these blocks and have been floundering with getting a layout. There is an uneven number of warm/cool colors and it makes for an uneven layout quilty-wise. I have been leaning towards C for no real reason. And I would love your input! I have the 241 bag pattern, too! I would like to make a bag using it by the end of this month. We'll see how that goes! 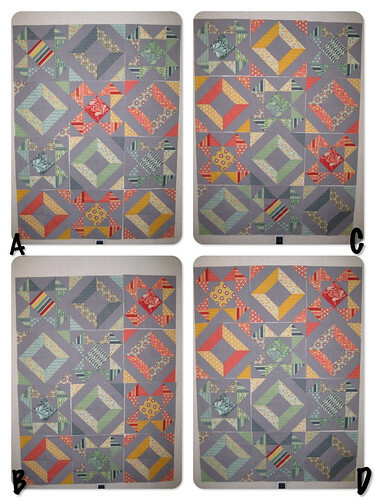 I am drawn to quilts C and D. They seem the most "balanced" of the four. I am loving that iPad pouch - now just to get myself an iPad so that I can make one ;) Also loving that block! A is speaking to me most, because I like the way the red cross section in the 2nd layer 'pops'.